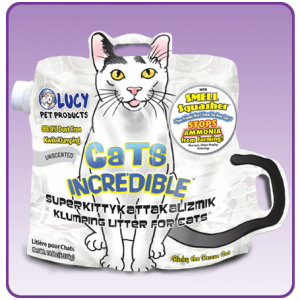 Cat’s Incredible Cat Litter from Lucy Pet Products is a Must-Try! : Giveaway Opportunity! You are here: Home / Pet Corner / Cat’s Incredible Cat Litter from Lucy Pet Products is a Must-Try! Cat’s Incredible Cat Litter from Lucy Pet Products is a Must-Try! Giveaway Opportunity! Looking for a Cat Litter that works great? My new favorite is the Cats Incredible™ Unscented 14 lb Clumping Cat Litter! I like that it really helps keep a littler box smelling better! It has Smell Squasher™ technology that prevents that stinky ammonia small from forming. I also really like the packaging because of the easy-to-pour spout. This one is highly recommended! We have 3 cats so a litter box that stays smelling good longer is a real plus in our house! You can find it here. It is also available in Lavender and sizes 14lb or 25lb. We have teamed up for a Giveaway! One winner will win their own Cats Incredible Cat Litter! Leave a comment below telling us a favorite thing about your Cat! Deadline to enter is November 21st, 2016 at noon PST. One winner will randomly be selected via Random.org. Self Disclosure: I received a free sample to facilitate this post and giveaway. My cat gets along with all the other animals. My cat is so cute she loves people…always hanging out with us when company’s over. I love that George tolerates the children. He is getting old and still manages to just wander away from them….or run when needed. My cats are my family. I love how my cat gets along so well with my little girl. I love how my cat always greets me when I come home!